When the Soviets invaded Afghanistan in December 1979, the first armored vehicles that hit the ground were VDV BMD-1 airborne infantry combat vehicles. But while useful and easier to transport than the larger BMP-1, they suffered the same problems once they got into the mountains. The 9M14 Malyutka missile was close to useless and could not be reloaded easily, and the 73mm closed breech grenade launcher could not elevate to a useful angle to engage Mujahedin in the hills. Some 2,500 BMD-2 vehicles were built to compliment the approximately 3,000 BMD-1s and today most of both series are in storage. The vehicle is still in first-line service with the Russian VDV units. Panda has now matched its BMD-1 with a kit of the BMD-2. 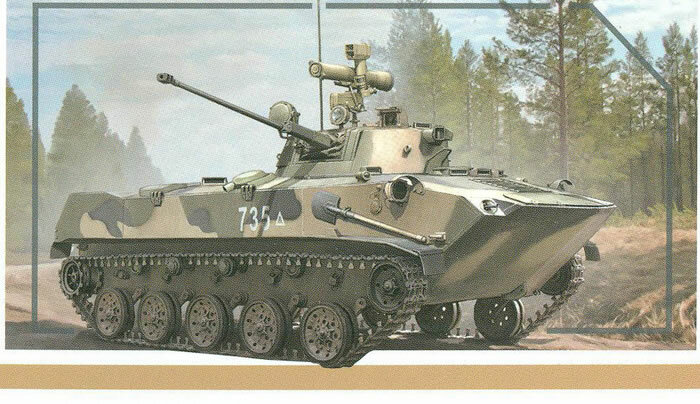 Prior to this both Eastern Express and Zvezda had released kits of the BMD-2 - the EE one came with etched brass but the Zvezda kit was the better of the two. With the release of this kit Panda has now taken over the lead. The model is cleanly molded and uses slide molding to provide a hollow bore for the 30mm cannon. There is no interior at all and only minimal detail on the inner sides of the hatches which is a shame. The kit is of one of the standard or later production vehicles with the “pierced dish” wheels (the “starfish” wheels were on the early vehicles only). Note that both sets of wheels are present in the kit so you could do a very early or standard production model from the kit. There is no clear sprue with the kit so all lights are solid as are all viewers. The one major bugaboo to the kit are the tracks - tiny links 7 x 3.5mm with a SEPARATE guide tooth. Admittedly Panda has captured the correct profile of the guide teeth - sort of like a profile section of a light bulb - but the teeth are very tiny (about 2 x 1.5mm) and are going to be very tedious to install. The photoetched ranges from very useful to “are you kidding?” with incredibly small footman loops for tiedown straps. Like EE the headlight guards are formed from bending etched parts to shape. Finishing and marking is provided for four different vehicles: VDV, bort number 735 (white) in a three-color camouflage scheme (sand/black/dark green); bort number 702 (white), solid dark green; bort number 335 (white), Peacekeeping Forces (probably Georgia 2008), dark green with MS markings and blue stripes; and rebel forces, Donbass, 2013 (dark green with two sets of stencils and green tabs for “Donbass Peoples’ Volunteers”. Since Soviet/Russian airborne divisions had three regiments in each one the first one is probably from the 3th Company (1st Battalion) of one, 702 is from the command group (regiment), and 335 is from the 3rd Company of the 1st Battalion. These are provided on a medium sized sheet. Overall this is a nice little kit but as with the BMD-1 kit the tracks will drive some strong men to drink. If you can replacement with an easier set it is mostly a simple kit to build.